guala and Taxco are two cities in the Mexico state of Guerrero. Only a few miles apart, these two cities are in the northern part of the state near the east border of Guerrero and Morelos. 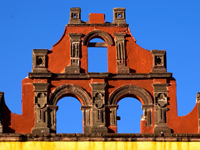 The Iguala - Taxco Phone Book contains both Yellow Pages and White Pages. This directory has an index in both Spanish and English as well as tourism information in both languages. in Iguala-Taxco with Mexico Yellow Pages and Whites Pages.